If you have an abundance of tomatoes, this is a delicious way to use them up. Check out the recipe in this meal plan to find out how to fire roast the tomatoes. Or - feel free to peel, seed and chop up enough to make 3 1/2 cups of tomatoes and juice. 1. In a large stock pot, heat the oil on medium heat and cook the Italian Sausage, breaking it apart as it cooks with a wooden spoon). Remove sausage from pan and set aside, draining any excess fat. 2. Add the onion to the stockpot and sauté until translucent. Then add in the garlic, and stir for a minute or two. 3. Stir in the red pepper flake and allow to cook for a minute. 4 Stir in chicken broth, diced tomatoes, uncooked pasta, tomato paste, oregano, basil, salt, and black pepper. The pasta will cook as the soup simmers. 5. Bring the soup to a boil, then reduce the heat to medium-low. Add the Italian Sausage back in and allow the soup to simmer for about 30 minutes. 6. Pre-heat your broiler on high. Make the cheese topping by combining cottage or ricotta cheese, parmesan cheese, and mozzarella cheese. 7. To serve, spoon about 1-2 cups of soup in oven safe bowls. Spread some of the cheese mixture over the top and broil for a few minutes, or until the cheese is all melted and bubbly. 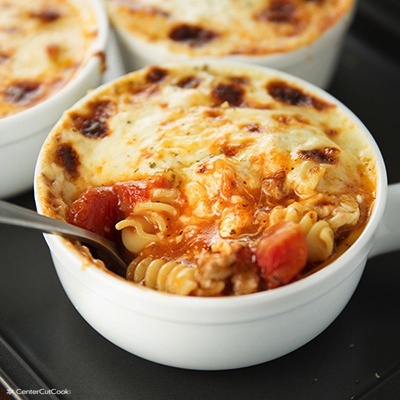 Keep a close eye on the bowls of soup as the cheese melts so that it doesn’t burn.